Cahoj started looking for solutions a few years ago and created a company, Liberty Biofuels LLC, to pursue bio-oil production through fast pyrolysis, but soon found he had a greater interest in the biochar co-product than the oil. He learned that it is hard to find the “sweet spot” that optimizes both biochar and bio-oil production and as a small farmer with limited resources, he decided to focus on biochar. Biochar struck a memory chord for Cahoj, taking him back to his childhood on a row crop and cattle farm in Northwest Kansas. He remembers looking at a handful of soil and seeing bits of black carbon in it and asking his father: “When did a fire come through here?” Later he learned that the black carbon in the soil resulted from the long history of prairie fires that swept the Midwestern plains of the United States, creating conditions of heat and oxygen-starvation in the prairie grass root-zone where biochar was produced. This biochar accumulated over thousands of years of repeated burning, creating some of the most fertile soils in the world. But according to Cahoj, synthetic nitrogen fertilizers and constant tillage are degrading these soils. Recognizing that farmers need techniques for soil restoration that are simple and affordable, he developed a gasifier specifically designed for switchgrass, a native prairie grass that is easy to grow. It also makes a superior cattle feed and the deep root system of switchgrass helps to build soil carbon. Switchgrass is high in lignin, making it a good biochar feedstock. Cahoj saves the first cutting for cattle feed because it has a higher protein content. For biochar, he waits until the switchgrass goes dormant in the fall and then cuts it with a sickle mower, rakes it and round bales it. Baling it keeps the bulk of it dry so it is ready to use in the gasifier. Cahoj’s gasifier is based on the concept of a trench in the ground that has both primary and secondary air inlets to create a clean burn. But rather than dig into the erodible ground, Cahoj made his trench out of metal and he is offering his instructions to the public on the IBI Open Source Technology page. 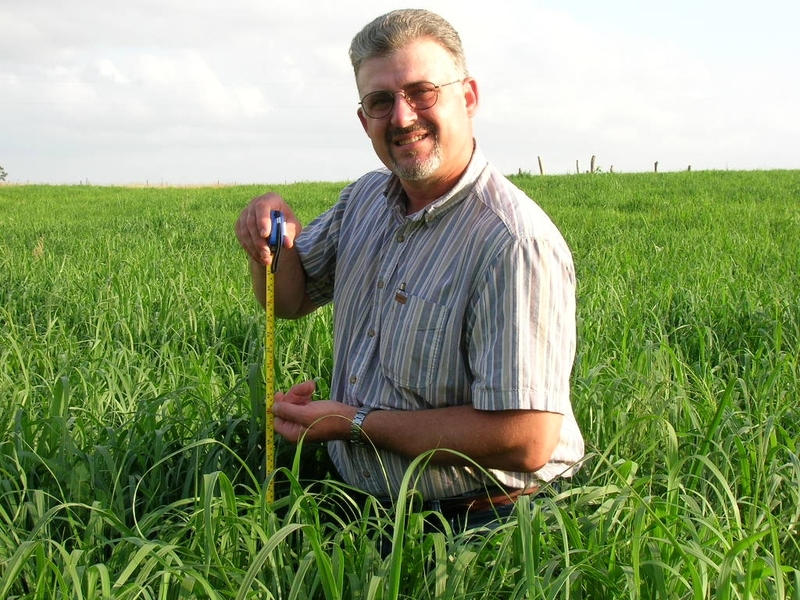 His goal is to help farmers become more self-sufficient and less reliant on costly inputs that degrade soils over time. Laird has not analyzed the char produced by Cahoj’s switchgrass pyrolyzer, so he cannot make specific prescriptions for use of the biochar in the soil on Cahoj’s farm, but Cahoj has undertaken his own small-scale biochar trials in his home garden. He has also given samples to friends and neighbors who are pleased with the results. He sees friends and neighbors around him going through hard times. People have become more reliant on their home gardens for food to eat. “Biochar can help increase food security,” Cahoj said, “and that makes me happy.” For more information on this work, contact Ed Cahoj. Photo: Switchgrass in the field; courtesy of Ed Cahoj.